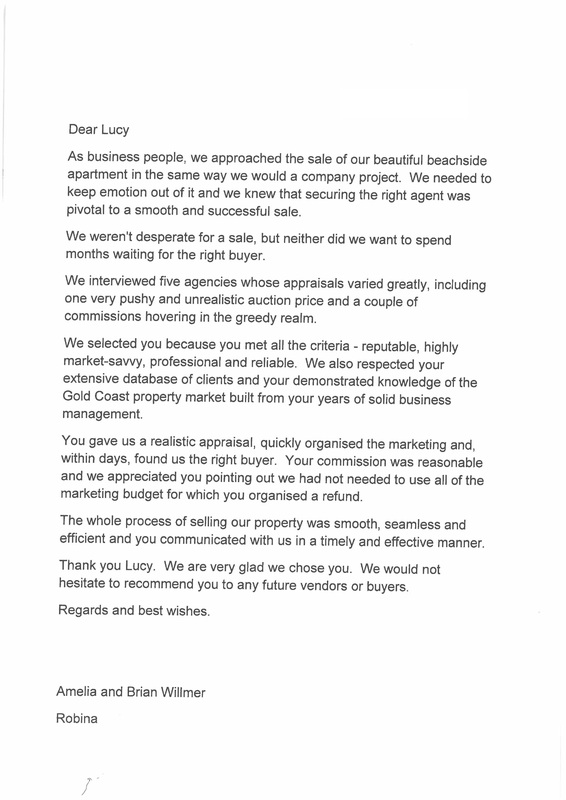 I would like to take this opportunity to say a few words in writing to you and to advise that we were “Super Impressed” with the highest level of professionalism, dedication and service and going that extra mile for us as Sellers to a favourable outcome. Thank you!! 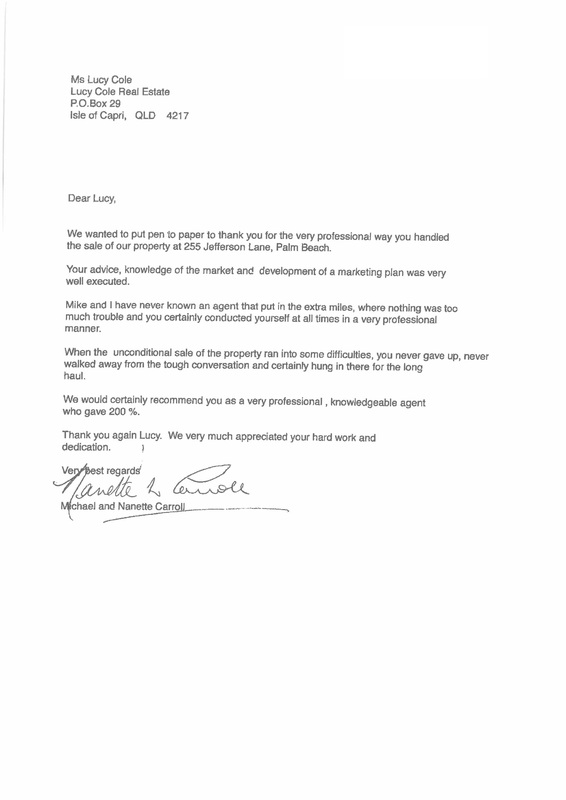 Our property at Broadbeach Waters was a beautiful home and at first was hesitant to place on market however am glad we walked into your office, you were thorough, you had taken it on yourself as the Proprietor and for this it was a sense of relief as we knew we were in good hands. Resulted in a firm buyer within 48 hours of it being advertised to then 28 days later had settled. Regardless of all the obstacles faced you managed to keep it moving and always be on top of anything that raised potential risk and took it on personally as the proprietor and for that we are most grateful. Throughout the process you managed to make it seamless for us as Sellers given the urgency of myself and my situation you took it as a personal goal to ensure I remained updated and that you were looking after things on our behalf for e.g.. in terms of inspections with the tenants / Works to be done to get the sale over the line the tenants caused a few issues and were reluctant to provide the necessary access you ensured you took this on even though we were the property managers. You most definitely live and breathe the true meaning of “Prestige Selling Agency” as you were working for us and delivered on our needs as Sellers. 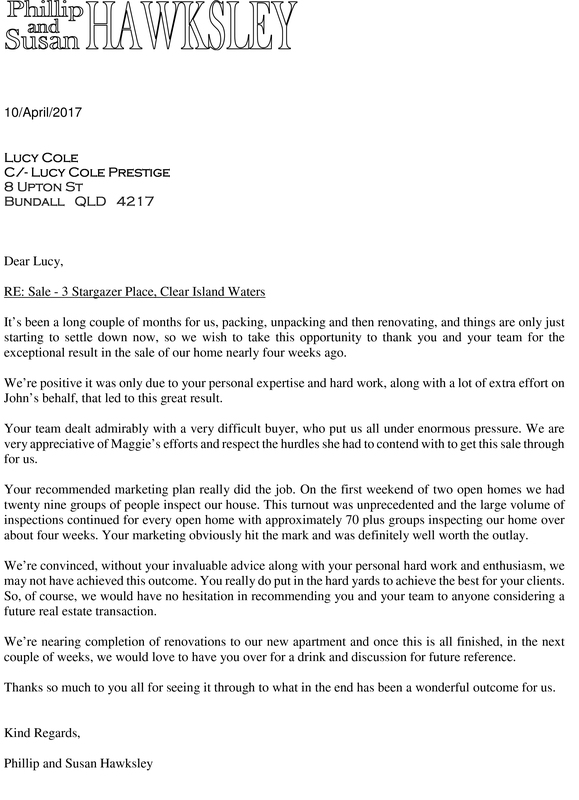 Nothing was ever too much and too late regardless of time or effort for you and your team at Lucy Cole. I would highly recommend you to all my colleagues, family and dear friends should they need to look at Property Services in the future.